The cowboy is the American knight, so it would follow that tales of knighthood can provide the inspiration for stories about cowboys and the basis for this grand and dazzlingly innovative epic of the old American West by the celebrated author and screenwriter of Urban Cowboy. Inspired by Sir Percival's great quest for the Holy Grail, Aaron Latham has crafted a classic adventure story set among the tumbleweeds of the American West at the twilight of the nineteenth century. It is first and foremost the coming-of-age story of an innocent -- a fledgling cowboy, that singularly American update on the archetypal knight of old. Featuring characters from Latham's acclaimed Code of the West, The Cowboy with the Tiffany Gun is his most exhilarating performance yet. Our young hero is Percy -- but he prefers his nickname, Pyg, short for Percy York Goodnight. When he learns that the man called Loving has been shot and is near death, Percy and his mother, Revelie, rush away to be by Loving's side in Texas. Long ago, Revelie shared with Loving a bond of great passion. Mother and son arrive to find Loving gravely ill -- and to discover that an heirloom ax has disappeared from the ranch. According to Western lore, this was the very ax that Jimmy Goodnight, Percy's presumed father, once pulled out of an anvil. The ax was stolen from the cemetery, where it had been imbedded in Goodnight's tombstone. The stone is gone, too. Latham's historically authentic narrative takes off on a rousing gallop here as Pyg vows to find the ax and must face trials and calamities of a Biblical scale -- flood, fire, gunfights, and the devastating pestilence that changed the course of frontier history. Of Code of the West, James M. McPherson wrote that "Latham has pulled off the seemingly impossible." With The Cowboy with the Tiffany Gun, he has done it again. Revelie ducked, then crouched. Emotions exploded in her head: She hated the sound of guns. She despised what guns could do. She loathed what she herself had done with a gun, for she had done the worst thing. Now this frightened man-killer found herself crouching at the feet of her son, who stood tall and fearless. Of course he wasn't afraid. He had never seen what guns were capable of because she had never allowed guns to come near him. She had carefully shielded him from their violence all his life. The mother understood why she was afraid -- while her boy was fearless -- but she still felt a little silly. "Please help me up," said Revelie, extending her hand. "Okay, Mumsy," said Percy, sounding younger than his seventeen years. Taking her hand, he lifted her gently. "Don't be ascared." "That's not a word, Percy. It's not in the dictionary. You must always speak correctly. Please." Soon mother and son were once again promenading along Atlantic Avenue, which skirted the Boston Harbor. They walked south with the water on their left. "They're just playing," said Percy, "because it's the Fourth." He pointed. "See." "Percy, don't point," said his mother, who nonetheless looked in the direction he was pointing. Revelie saw a paddle-wheel steamship with a dozen cannon pointed right at her. Bright American flags with thirty-four stars waved above the ship's crowded decks. All hands had turned out to enjoy the sun and fire the cannon. She told herself that they were surely firing blanks, but she had a hard time believing it. She saw smoke. BOOM! This time she cringed instead of ducking. She told herself that she was making progress. Revelie -- who was still beautiful at forty-three years of age -- tried to concentrate on the beauty of the harbor scene. She was slightly taller than average. Her hair was now light brown with rare silver threads running through it. Her ample but tightly laced figure continued to conform to the hourglass ideal. Her legs were concealed under her ankle-length skirt. The harbor was filled with dozens of other ships with sails or steam engines -- even some with both -- all flying starry banners. Revelie picked out a favorite, a tall sailing ship with three masts and square sails. Sailors stood shoulder to shoulder on the great crossbars -- yardarms -- so they looked like birds on a wire. She hoped they wouldn't fall. Strolling along, they passed wharves, all of which had huge warehouses built on them: great, fat fingers of commerce reaching out into the harbor. First came Lewis Wharf, then Commercial Wharf, T Wharf, and the longest, Long Wharf. Slow horse-drawn wagons piled with goods rolled past them. Revelie shuddered. She had always loved Boston because it was so civilized, so insulated from raw violence, ruled by law instead guns. Except on the Fourth, apparently. Guns had won the Revolution and guns were used to celebrate its victory. She understood it, but she didn't have to like it. "Let's get out of here," said Percy. "Thank you," said his mother. At India Wharf, they turned right and walked up India Street where they moved in the shadow of four-story, red-brick buildings. Their cobblestone path bent to the right. None of the streets were straight. They passed the Chamber of Commerce with its pointed roof that looked like a wizard's cap. At the Custom House -- a "Roman" temple with six fluted columns and a domed roof -- India Street ran into State Street and disappeared. A couple of blocks later, State changed its name to Court Street. These lanes were crooked, changeable things. Now buggies and carriages joined the wagons moving up and down the narrow streets. "Be careful," said Revelie. "Don't get run over." Then she regretted her motherly timidity. The guns in the harbor had unnerved her. But his mother couldn't help worrying. The world had convinced her a long time ago that it was a dangerous place. She considered it her paramount duty as a mother to defend her child against dangerous weapons, dangerous people, dangerous situations. She had named him Percy in part because it seemed such a safe name. Percys didn't get into fights, did they? Percys didn't go looking for trouble. Percys didn't throw their lives away. Percys wrote poems and obeyed their mothers. Of course, Revelie sometimes worried that maybe she was too protective: worried that she worried too much. After all, Percy certainly looked like a young man who could take care of himself. He was six feet two inches tall and weighed a thin 175 pounds, more or less. He had dark brown hair, a straight nose, a few freckles, and changeable eyes that sometimes seemed blue and other times looked brown. He wore a black frock coat, snug cream-colored trousers, and a large, loosely tied cravat. He had left his top hat at home. His mother admired his grace: He walked gracefully, turned his head gracefully, moved his hands gracefully. And he had the spontaneity of a child. On the left loomed the elegant Old State House built of bright red brick. It had a second-floor balcony, a steeple, and a lion and a unicorn on the roof. "They read the Declaration of Independence from that balcony back in '76," said Revelie. "Mumsy, you tell me that every Fourth." "Why do you think I picked this street?" "I see. What is our next port of call?" "The Common. Okay with you?" "The Common. Then the Garden. Then home." When they reached Tremont, they turned left and there before them stretched those twin parks: the Boston Common and the Public Garden. They were actually Siamese twins since they were forever joined by a shared fence. "What's the matter?" asked Percy. She was so rattled that she pointed. Her son followed her aim and saw a dozen great guns lined up in a row on the Parade Ground in the far corner of the Common. "More cannon," she said. "They're not going to start shooting too, are they?" "Don't know." Her son smiled. Behind the cannon were the troops. A company of blue-clad soldiers were showing off their skill at close-order drilling: slapping their rifles, shouldering their arms, lowering them, lifting them, twirling them like batons. Revelie shivered. "I hate all these guns, guns, guns," she said. "They're so dangerous." "Sorry," he said. "Let's go see the Garden." They passed through a long, narrow shadow cast by the Army and Navy Monument, which consisted of a single column with a warrior standing on top. Revelie found this shade cold and shivered. Following a well-trodden path, they approached the double gate that connected the Boston Common to the Public Garden. "I like the Garden better anyway," said Revelie. "Don't say 'me, too,'" she corrected. "Say, 'So do I.'" Revelie criticized herself for being so critical, but she had hoped sending him away to Andover Academy would change him. Rid him of what she thought of as "baby talk," but it hadn't. And he was supposed to go to Harvard in the fall. Would he fit in? Would they make fun of him? She hoped her overprotectiveness hadn't contributed to his seeming reluctance to grow up. Revelie stopped to enjoy the beauty of the Garden's large pond with a fountain in the middle. She preferred the sound of gurgling water to booming fieldpieces. She glanced back over her left shoulder to make sure nobody was lighting any fuses, but trees blocked her view. They crossed the bridge to the other side of the pond, where they found George Washington blocking their way. The father of his country rode a proud horse and wore a three-cornered hat while his bronze eyes stared unblinkingly at the horizon. "Let's go see what's going on over there," said Percy, pointing. Copyright © 2003 by Aaron Latham. 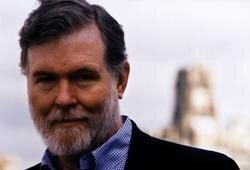 Aaron Latham is best known for his novels and screenplays, including Urban Cowboy, Perfect, Code of the West, and The Cowboy with the Tiffany Gun. He has been a regular contributor to such publications as Rolling Stone, Esquire, and The New York Times. He lives in New York with his wife, Lesley Stahl. James M. McPherson author of Battle Cry of Freedom Aaron Latham has done it again. Continuing his allegory that transplants King Arthur and his knights to the cowboy culture of the Old West, he tells a gripping and often funny tale of a quest for the modern version of the Holy Grail in Texas of the 1890s. Those who enjoyed Latham's Code of the West will find here a worthy successor. Patricia Cornwell Beautifully written and seductive, The Cowboy with the Tiffany Gun again proves that no one writes American Westerns the way Aaron Latham does. His storytelling carries you into a mythical, menacing, old world you can see, smell, taste, and touch, and when Latham's novel ends, you will beg for more. Linda Fairstein Aaron Latham has staked his claim on Texas -- and branded the territory with his original mark of brilliant storytelling and characters unique to the American West. 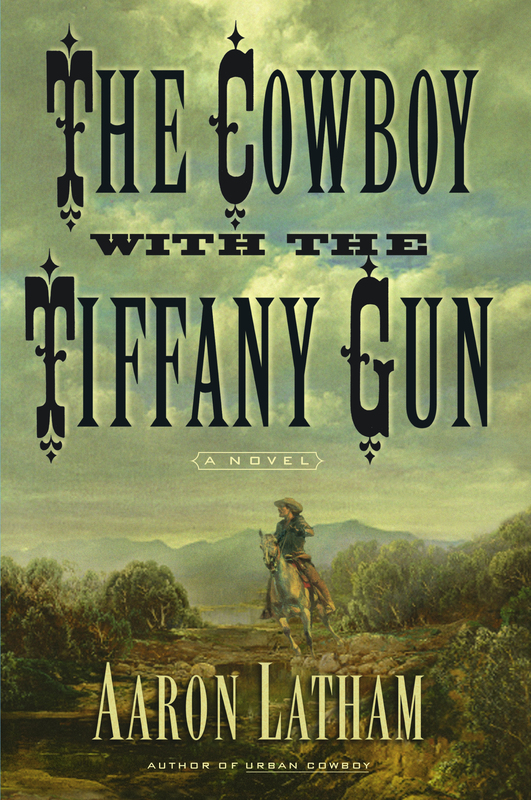 The Cowboy with the Tiffany Gun is a stunning epic. Put on your spurs, saddle up, and prepare to ride off into the sunset -- it's a riveting tale. Jim Lehrer This is an extraordinary piece of work. Novels are supposed to work on many levels and here, now, is the rare one that actually does. It's a page-turner story from beginning to end. The characters leap out as real, believable -- the kind that stay with you long after their stories end. The Texas settings and the wild times are captured with the vividness of a fine painting. And, if all of this weren't enough, the book reeks with meaning and purpose. David Brown A truly extraordinary tale with unforgettable characters and gilt-edged action. In the pantheon of writers of the American West, Aaron Latham stands as tall as his young character. This is the true West and the story will charm and excite you. Read it and be grandly entertained.